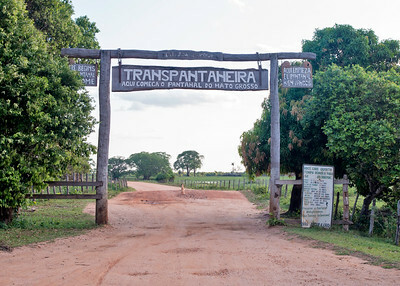 The scenic Trans Pantanal Highway. 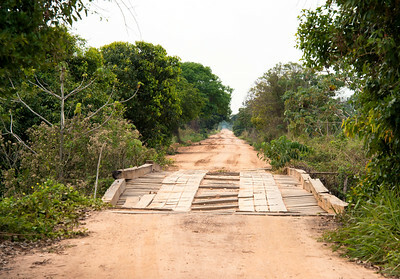 Not exactly 4 lanes, divided. Wattled Jacana forages, using a Capybara as a perch. 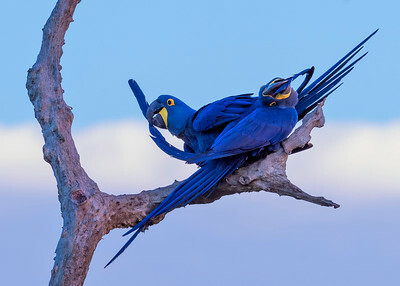 Hyacinth Macaws preen each other in the early morning light. 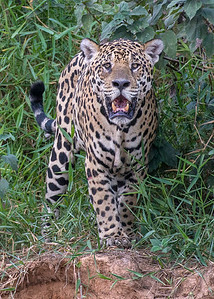 Old scarred Jaguar prowling the bank of the Cuiaba River for prey. 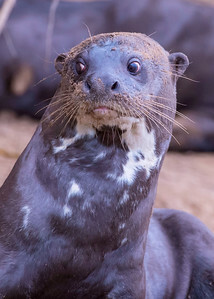 Giant River Otter checks out his family after a dust bath. 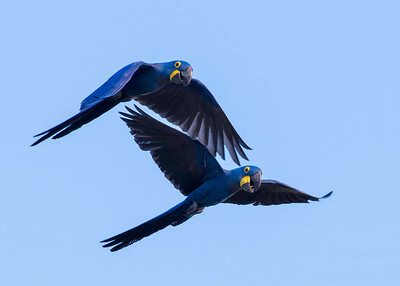 Lower and to the left. Southern Caracara grooms ticks off of a Capybara. Southern Caracara grooms ticks off of a Capybara. The Capybara rolled over to present his belly to the bird. 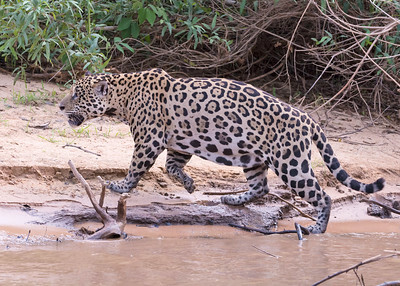 A male Jaguar slinks up the beach after spotting three Capybaras. They saw him, snored in alarm, and one dove into the river. 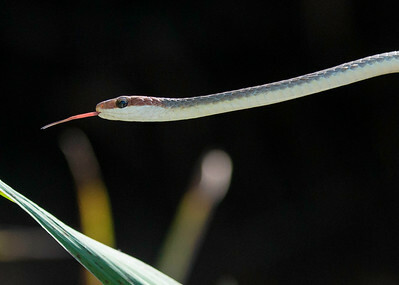 Spotted (ha! 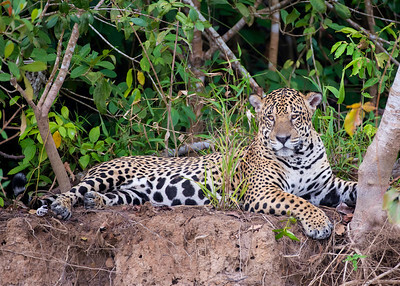 ), the Jaguar gave up and slipped away into the brush. 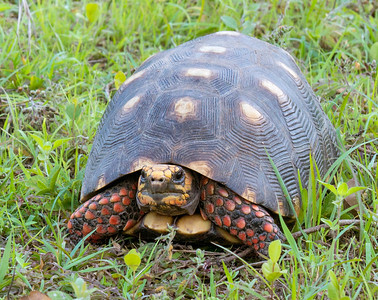 We found this Red-footed Tortoise, Chelonoidis carbonaria, next to a fence one evening when we stopped to open a gate. The annular rings on her shell are not worn smooth, and suggest that she was less than 10 years old. 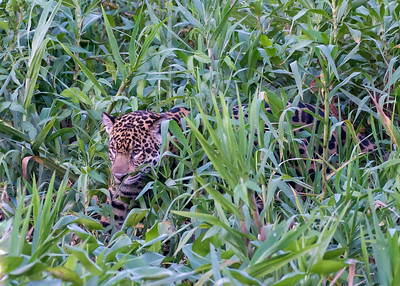 We found this female jaguar prowling the thick brush of the riverbank at dusk and followed her for 30 minutes, by which time it got quite dark. 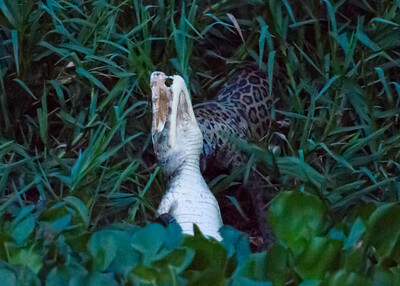 The jaguar had a caiman by the back of the neck; the caiman was clearly incapacitated, and barely struggled. 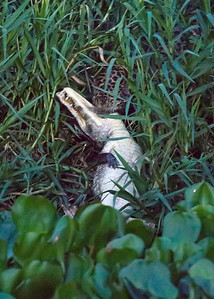 It was now so dark that I could only see the white underside of the caiman with my naked eye, but that was enough to know what was going on. The jaguar blended into the dark background and I only saw detail in the images later. 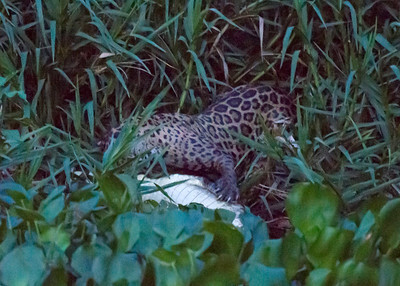 Once the caiman was on shore, the Jaguar adjusted her grip. Check out those claws! 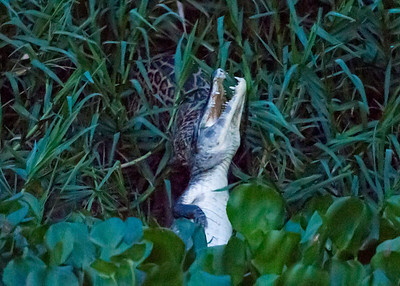 The Jaguar shifted her grip form the back of the caiman's neck to its throat. 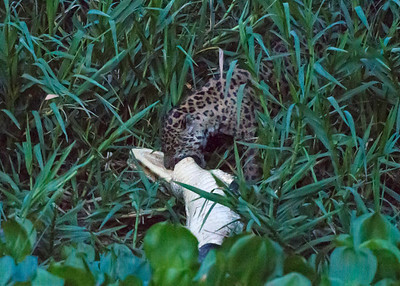 The Jaguar got a good grip and dragged the poor caiman out of sight into the thick brush. 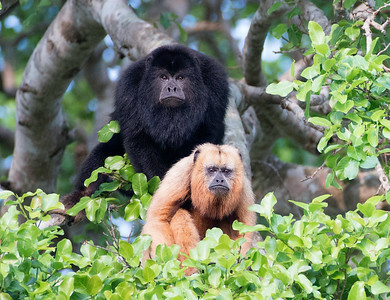 Black Howler Monkeys; only the male is black, while the female and juveniles are light brown to buff-colored. 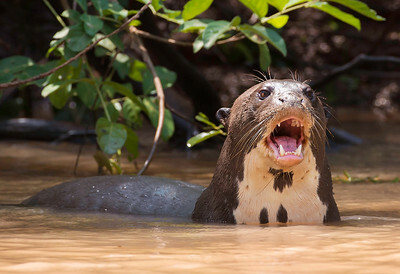 This Giant River Otter lost his pack and was swimming back and forth frantically, calling for them. Sleeping off a big meal. We watched him sleep and stretch and turn for an hour and 15 minutes. 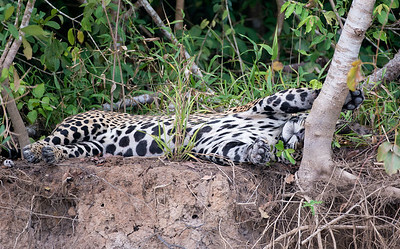 This Jaguar was sleeping off a big meal on the bank of the river. 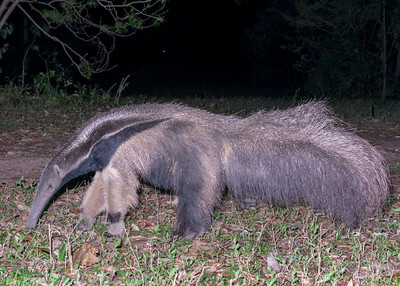 This Giant Anteater was wandering the grounds of our lodge, feeding in anthills, when we returned from road cruising for birds and critters after dark one night. 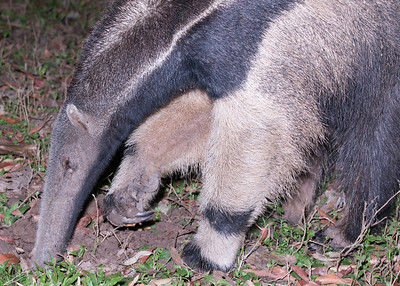 This Giant Anteater is feeding. Note the dirt on his formidable claws and the many ants on his nose and feet. A tapir, one of a pair, came out of the forest and entered the weed-choked pond at twilight to cool off. 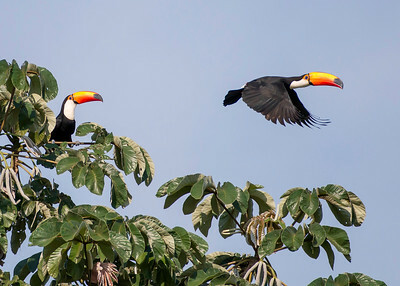 He liked that notch on the side of the palm tree; it seemed to give him a good grip and he kept returning to it. 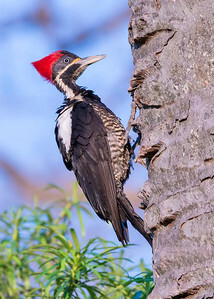 "What's that little woodpecker's name?" "Yes." "What's its name?" 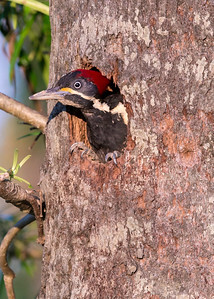 "The Little Woodpecker." "That's what I'm asking YOU!" 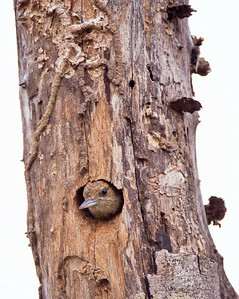 "No, that's its name, the Little Woodpecker." 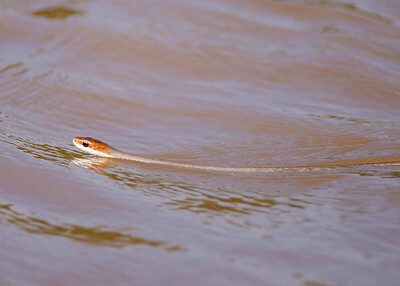 Central Sipo Snake swimming in the river.